At the beginning of every year, we love to lay out our project goals, things we’re aiming to check off! At the end of the year, we look back and see how we did (you can see last year’s report card right here). This is already shaping up to be a busy year, which is why it’s the third week and I’m just now writing this!, but at the same time it feels weird to only have a couple small items on our list for our home. I never thought I’d say it, but our house is pretty much d-o-n-e! What?! It doesn’t feel real, but at the same time it feels so good. There are two things that we’d like to tackle at our primary home this year to really finish it off. 1. The Stairwell. We’ve done a lot here already. I mean, a lot! Added a new railing and new lighting and painting and updated the carpet and landing. But it still doesn’t feel done. Do we add box trim to the walls? Not? Still undecided. But I know for sure we want to patch all the holes in the walls we made years ago when I hung a gallery wall. Finally caulk the baseboard and touch up the paint. 2. Outdoor lighting. The only other thing on the list for our own home (I think!) is adding some pretty uplighting outside. We have your standard porch lights, garage lights and even corner lights under the eaves. But I’d really love to light up our home at night! There are a lot of houses on our street that have it and it makes it look so homey. The rest of the projects on our list this year take place at our a-frame. 3. Finish the Kitchen! We have a really good head start here. The appliances are getting here next week (fingers crossed! ), our island is about 6 weeks out, we need to tile the backsplash and add a hood. It’s a small kitchen, but I already can’t believe how far it has come. 4. Brace yourself–we have 4 bathrooms at the cabin to do. Although none are complete guts–I don’t think. We want to update the tile floors. 2 need new vanities and mirrors. One is brand new (which will be the most work) and the loft bathroom just needs paint in addition to new flooring. It feels a little overwhelming writing it all out, but we’re just going to take it one bathroom at a time. 5. 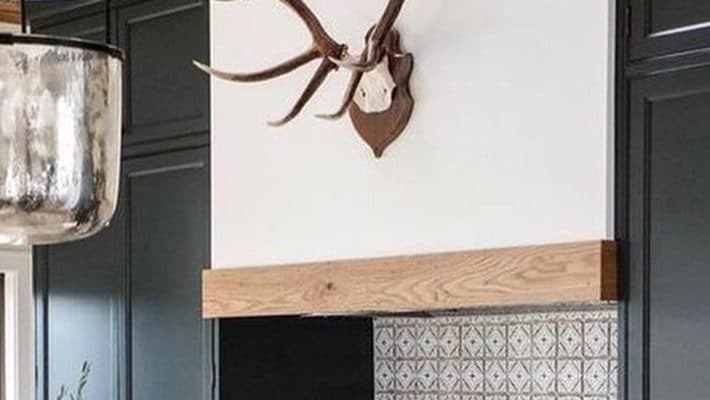 Painting the downstairs–I know this doesn’t seem like it’s even worthy of a whole project slot on this list but I am counting on painting the basement of the cabin to completely transform the entire space. I’m excited for it. It’s all very poop brown right now and I don’t know if we’ll go light or dark but I’m so READY to get my paint on down there. 6. 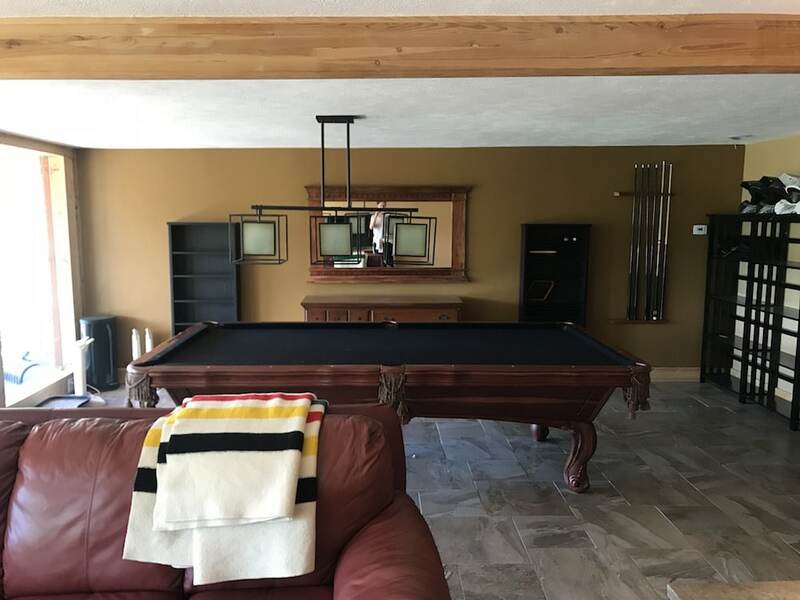 Lake bedroom–We discussed our plans for this space in this post, but downstairs we converted an open area that used to just have a pool table, into a bedroom and bathroom (the first photo above is where we are now). We’re calling it the Lake bedroom because it has the most amazing views of the water. When it’s done, it will be the master bedroom since it’s the only one with an en suite. But right now, it’s rough. All the leftover, squeaky furniture. All the brown walls. 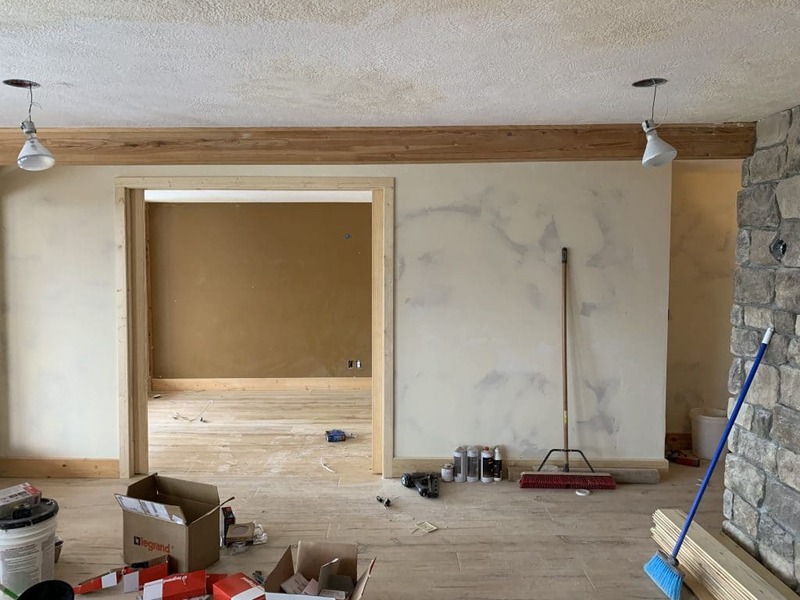 It really needs window coverings and light fixtures…maybe some pretty wallpaper! We’re excited to make it really special. 7. Crow’s Nest– In the loft, above the bathroom and spanning across the french doors, we’d really love to add a little crow’s nest. An extra, fun place for the kids to climb up and play. 8. Laundry room–Although last on this list, the laundry room is one of our highest priorities right now. We currently don’t have a washer or dryer up there and it is really the only thing left that is hindering full enjoyment spending time up there. Hauling bedding and towels back and forth. Making sure we bring lots of extra clothes. We have this on our list for February and are already starting lots of planning! So that’s our plan for 2019. I think we can get the cabin done by the end of this year, although we’re not in a huge rush. What’s on your list for this year? 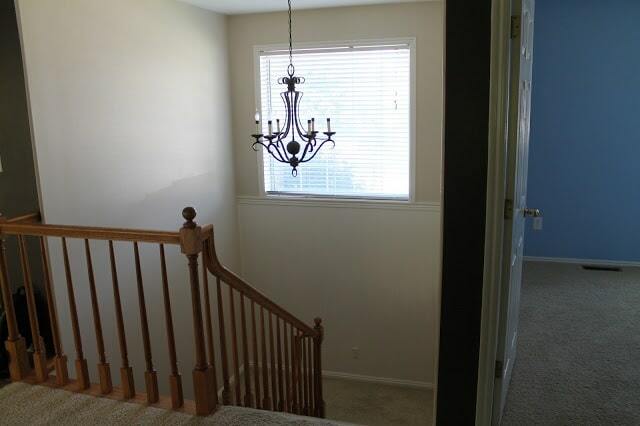 I notice the Stain Master carpet on the stairs in above picture looks in good condition. I remember you discussed choosing such a light color when it was installed. Would you recommend that after your experience ? Yes! We are really happy with it still. We’ve got to put a runner on our stairs between our first and second floor for our pup and baby on the way! And tackle a large basement space – 1300 sq. ft! We already have 4 bedrooms – so probably won’t add more, but trying to figure out layout of the living spaces (and what will be most functional) and laundry room down there is tough! Excited to follow along! Let’s get this party started! I’ve no doubt it going to be terrific. By the way,I love the look of your stairwell at home as is. It’s classy and modern with clean lines! i’m with you on painting! we’ve spent the past 1.5 years stripping paneling and patching original beadboard in our farmhouse. every. single. wall. 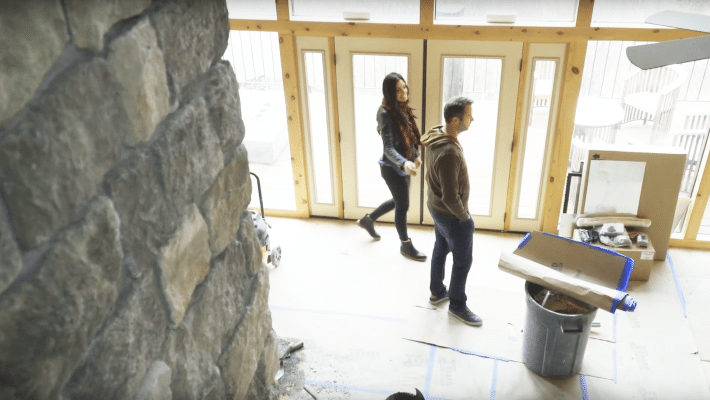 in our house has to be painted and it’s going to be a beast…but also a game changer! It would be nice to see realistic budgets and sponsorships. I get that this is your job and you get a lot of free product placement. But as someone who’s followed you for years the tone of the blog has changed drastically in the last two years. 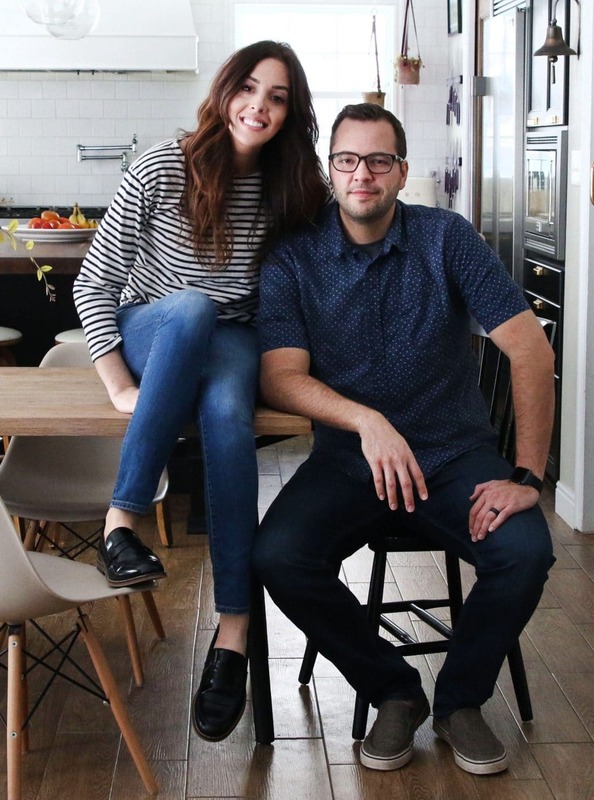 We try to share a big mix of easy, affordable DIY projects and big Renos. Fun! I now live in a sort-of mountain town so I love the cabin posts. 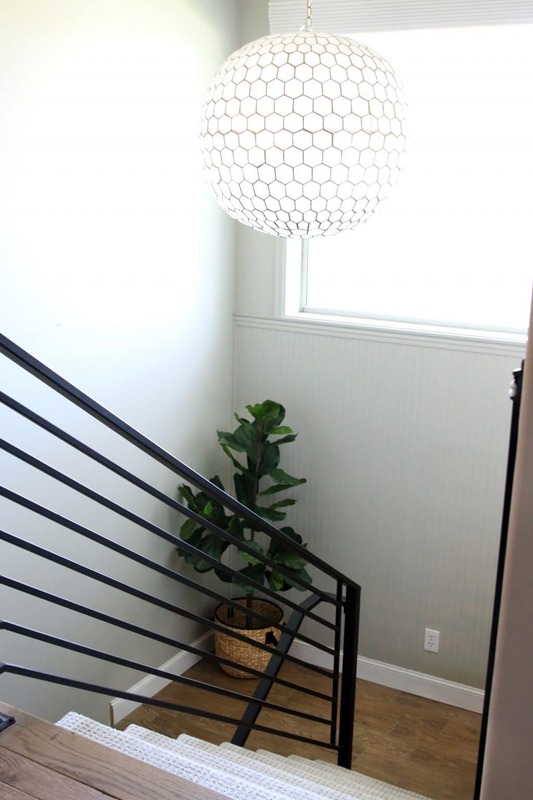 Now I always thought your stairwell lacked the inspiration of the rest of your home, so yay for tweaking that. The fake plant doesn’t do much for me but perhaps two large pieces of art – not a gallery wall as you already tried that lol, but something less busy and bitty. So excited to see the progress on the A frame! Did you ever share the floor plan/layout? I’m trying to piece all the different rooms together. About the 8th project: since you don’t stay in the cabin 24/7 just put a washer/dryer! Not just to save on money but you have additional space to put a bigger cabinet that will house laundry baskets and laundry supplies (organized & clean) !!! The stairway in your primary home could look amazing with some handsome wallpaper! I agree! But we have wallpaper on the entry wall adjacent. Exciting! Can’t wait to see what you do all year! I made a list of house projects (big and small) and when I showed it to my husband, he panicked. He couldn’t even read it all. I guess I should have edited it down to eight items. Oops. We’d love to do a flip! We’ve never done that. I was going to suggest a triumphant return to Baltimore for 2020. I’ve got a bathroom that needs desperate help. I promise to make time to see the sites too. We’d love to do a traveling project this year! Come to Pittsburgh! we have been going back and forth from renovations & additions to moving to a new house. We love where were are, and always dream that we could get you guys in here for advice!! Pretty please? We are planning a Pittsburgh trip to see family this year. Maybe we’ll do a meetup!? Very excited to see all those bathrooms get a makeover! We FINALLY get to spruce up the exterior of our home this year. I’m thrilled and overwhelmed at the same time! eek! I can’t watch to watch all the transforms of 2019! Did you guys already fix the flooring issue in your girls’ bathroom at the primary residence? There wasn’t a flooring issue (that I remember). There was an issue with their toilet and we got a power flush toilet and all is solved. Talked about that in this post! That’s funny — I ended up with 8 projects on our to-do list as well, the biggest/most critical ones being replace our dilapidated patio overhang and redo our shared home office (the rest are shared on my blog, purrfectlyhomey.com). So great that you’re almost done with your primary house! Must feel good. I rarely comment, but have been watching you guys since at least your purple wall days. It’s been fun watching your design aesthetic evolve. Excited to watch your cabin changes as they roll out too. Looks amazing thus far. SO EXCITED to see what you do! This year, we want to tackle 2 bathrooms (mostly just new tile) and our master bedroom, which is the one room that really stumps me! All sounds amazing! Just a question about the loft, how do you get it dark in there in order for the kids to sleep? Are there any curtains or anything right now or are you planning on something? 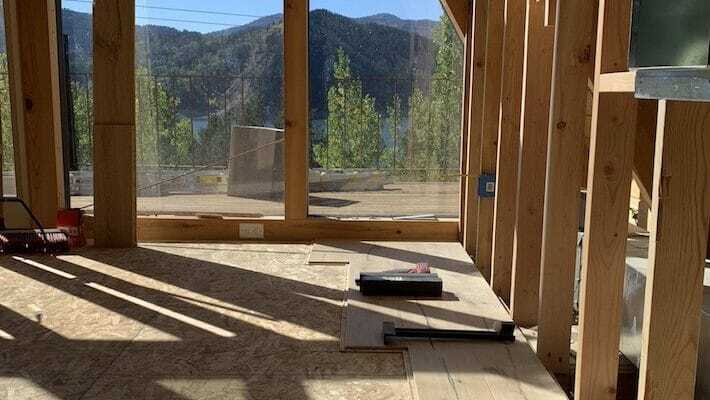 It will never be dark in the loft–so many windows everywhere! But when the kids get tired, they go to sleep. I am so glad my husband and I aren’t the only ones who refer to truly terrible brown colors as “poop brown.” So excited for all your projects! I’ve been thinking the same thing lately! I love when your list pops up on the blog because for me it signifies the coming of spring! I say, as I look outside at the snow and my temperature gauge in the car claims the outside temp is 25 degrees. But it’s like. The holidays are over, we’ve mostly recovered and gotten back into the swing of things, and there are new things on the horizon. My plan for this year is to buy a scroll saw! I haven’t been able to get it out of my head for the longest time and I think this is the year that I pull the trigger. Love the projects and love following along. We recently finished renovating a 6 bedroom house in Maryland before we moved to Germany. We did almost every single thing ourselves! Photos on my Insta. The one thing I keep seeing is the ceiling texture in the cabin- is it popcorn or something that can be scraped/fixed??? Is it possible to be just as excited as you are? Can’t wait to see it all done! Where is the washer and dryer going to go in the cabin? Love this plan for the year! There is a laundry room downstairs next to the forest room. A crow’s nest! I can’t wait for that how-to!